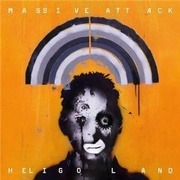 Massive Attack are in a difficult position. Their output now varies between classic beatsmithery; otherwordly sonic meanderings that seem to define an era of pre-millennial dread, and miscalculated, slightly off-kilter dinner party repetitions. Like 100th Window before it, a lot depends on Heligoland, Robert Del Naja and Grant Marshal's seventh studio effort in as many years. Opener 'Pray For Rain' is over-complicated, and sets Heligoland's enduring tone. Where previous outings were experiments in reserve: 'Group Four's seductive choral chants and economic guitar trimmings, for example, Adebimpe's clinical monotone is used to dulling, meandering effect. Same too with 'Splitting the Atom'. Horace Andy's usually affecting voice wobbles are stripped back and don't work well on their own, resulting in a song that, at best, sounds like a Mezzanine era cast-off. 'Psyche' is a refreshingly laid-bare loop piece; tunefulness soothing the dull resonance of the player's first half. When Massive Attack refrain from indulging in ideas so self-consciously muggy, their potential for stark originality is revealed once again. 'Flat of the Blade', original mix of 'Bulletproof Love' (which appeared on the underwhelming Splitting the Atom EP) is a skittering, macro-melodic love song similar to Thom Yorke's 'Cymbal Rush'. Length is once again its crucial pitfall, though: songs here are typically twice the length they need be, and Garvey's reserved, lovelorn ramblings end up fogged in the mire. Despite erring on the side of excellence with 'Paradise Circus; an extroverted, toe-tapping romp which revives its subject's expeditions on 2001's Bavarian Fruit Bread, Heligoland is a largely failed return, or merely a glimpse at what was once a tremendous source of inspiration to thousands who looked. Rather than doing what Portishead did with Third, and using their time to record something of steadfast beauty - textures enhancing what are, at heart, exceptional pieces of songwriting – Massive Attack have wasted an opportunity to grow. Songs teetering on the edge of substance are muddied with conventional uses of tension, build and rhythm and vocal use that does nothing to retrieve the album's detractively self-referential nature.